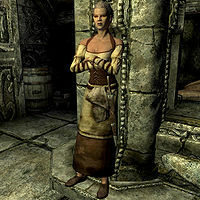 Uaile is a Breton witchblade who lives in Markarth. She is the daughter of Uraccen, a prisoner incarcerated in Cidhna Mine. She stays inside Nepos's house all day. She works as a maid for Nepos the Nose, or so she would like you to think. She is actually a Forsworn agent who guards the hall of Nepos's house and questions visitors to see if they are a threat. When Nepos reveals his little scheme in Markarth, she abandons her charade and attacks you on sight. She wears a set of barkeep clothes and a pair of shoes. She carries a key to Nepos's house and some lower-class items and gold. She is equipped with a steel dagger, but relies predominantly on spells in combat. Uaile knows the Alteration spell Oakflesh, the Conjuration spell Raise Zombie, and the Destruction spell Firebolt. "I'm here to see Nepos." "We haven't been expecting you, and the old man needs his rest. Come back some other time." "If you must know, I'm the maid. And the master of the house is old and needs his rest. So if you don't have any business. Leave." "This is a private home, and the master of the house is a very old man. He's not to be disturbed." if you enter the house a second time she'll ask you, "You again. What are you doing here?" You will have the same dialogue options and replies as above. During The Forsworn Conspiracy, you will be told to investigate a recent murder. Eventually you will discover that Uaile's master, Nepos, was the one that ordered the murder. Come to Nepos's house again and Uaile will stop you, though this time before she can finish her sentence Nepos will tell her, "Wait. It's okay, my dear. Send him/her in." She'll reply, "Hmph. Yes, Nepos. You heard him. Go on in." From now on, she'll repeat, in a begrudgingly polite way, "Go on in." After you talk to Nepos and he reveals the truth about the murder, he, Uaile, and the other servants—Tynan and Morven—will unsheathe their weapons and attack you, and you have no choice but to kill them. Uaile's death can be avoided by pickpocketing and reading Thonar's or Nepos's journal instead of questioning them, then going directly to Eltrys. This page was last modified on 24 January 2014, at 16:16.